I was curious (as much as the next guy) about the cannabis note however after sampling it I realized the obvious, the cannabis note was a marketing stunt. Moving past that I realized this was a really nice fragrance, it has some reallynice sweetness but not too much. The fragrance opens with a nice apple scent that stays for longer than I expected and blends with the tonka bean. Overall a nice scent, nothing ground breaking but worth checking out. I’m glad I bought it. Now I have found a shop from Spain that carries all the fragrances I wanted from this brand: 212 VIP Black, 212 Aqua, CH Chic and just this one. 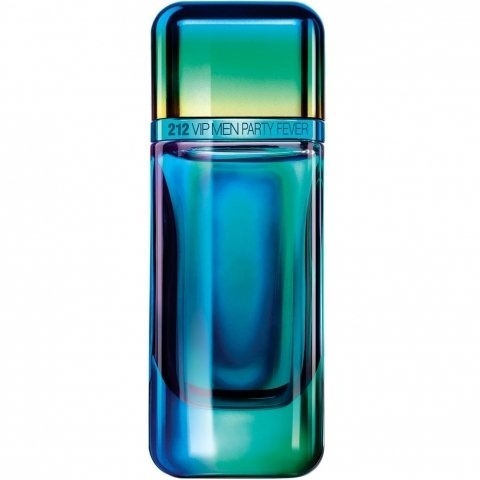 Of course I had to strike immediately, especially as the Aqua and this party fever are unfortunately limited editions. Users who often read my comments know that the 212/212VIP series is my absolute favorite. Party fever is already the 5th Flanker after 212 VIP, Club Edition, Wild Party, Black. 212-VIP is a sub-series, which rather goes in the direction of nightlife. The silver original is one of my favourite perfumes, which I often wear. This one is very modern, slightly prollig but also with a very very fresh side. For a long time, ginger and cannabis were the only scents to be found here. I added the pyramid here after I found it on the CH homepage. Only ginger & cannabis, that can't go well in a station wagon. Still: I wanted to have the scent like all of this series, I was also curious about the cannabis note. The price in the normal range is about 60 to 70 Euro a 100ml. The carton is very unusual and absolutely hits the mark: a metallic silver carton with a shiny look that changes colour in the light. Great job. In addition, an extremely attractive flacon like all of this series. The bottom of the bottle resembles a long drink glass like all of this 212 VIP series. The colour combination is very cool here and matches the Cannabis note. Tested with full tension the following result: First of all I have to say that you clearly smell the relationship to the original. The DNA is clearly represented. It starts right away very fresh. A citrus cocktail is very present with a ginger note which has already shone in the original. A discreet fruity note is also perceptible here, which is probably due to the red apple. Here citrus, apple and ginger harmonize very well. Especially the ginger note is very present. The heart note is also convincing: it is very gentle and does not exaggerate. The most exciting question, of course, is how the cannabis comes across. I have to say: If you don't know that cannabis is contained here, you wouldn't think of it. I smell something that might go in that direction, but it doesn't smell like you have weed in your pocket or you're smoking. But definitely a nice touch here. The base usually subsides. Tonka is a good sweet supplier over the entire course and is especially in the base stronger paired with some woods and musk. This limited edition is close to the original, but has refreshingly different accents. All in all a positive purchase for me. I think he's going further in the party direction as the name suggests. The fragrance definitely belongs in the nightlife. Especially for younger men or young at heart men in a stylish outfit. Fits rather to a cool or casual outfit/character. The performance is as decent as its original. Sillage and durability are suitable for clubs. All in all a great limited edition, especially for fans of the original. Not necessary as a permanent release, because I think the original is a bit better. Denooch a nice change and not only optically a nice alternative in my collection. Write the first Review for 212 VIP Men Party Fever!